I am a huge Roger fan and I can care less what has been said about him. He was a great Astro the couple years he was here. OK, so the cards... top row, could it get any more awesome? I love having Pettitte/Clemens dual cards. They were such great friends and they helped bring a World Series to town. 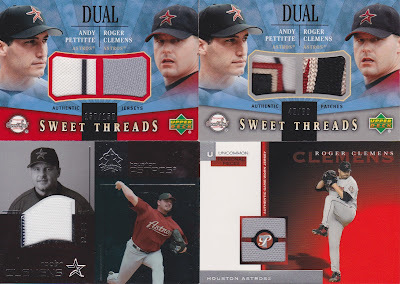 The relics on the top left card are cool and all, but they pale in comparison to the patch madness on the right. Upper Deck may have screwed themselves on the whole MLB license deal, but for a while they produced some pretty awesome cards (even if the validity of the "game-used" tag is questionable). Bottom row, got a nice pin stripe on the far left of the SP Reflections card, even if it seems to be a blue Yankee stripe... and then the Pristine is "Uncommon" but still #'ed /200. Not too shabby. Have a great Tuesday... stay tuned for tomorrow, I have some flame-throwing pitchers to show off!